Guardian Angels Church is in a modest neighborhood in the heart of Kansas City. Established in 1909 , Guardian Angels was originally a “National German Church.” The practice was common in the United States to create a “National church” within a diocese in order to meet the needs of immigrant communities more completely. 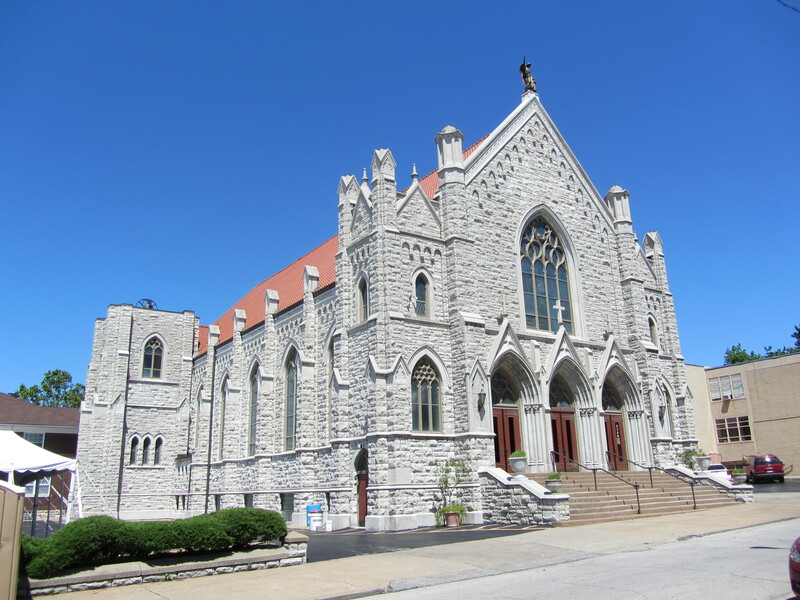 The Schutz Ange Kirche (Guardian Angel Church) parish was designated for all German-speaking Catholics in the south part of Kansas City and served the spiritual as well as social needs of the German- population moving into this area. During World War I these German speaking families were often faced with suspicion and antagonism. By 1918 the use of English in church services was becoming more common. The presence of a national church for German speakers ended in 1918 when the Bishop designated a geographic area that would serve all Catholics in what would now be a “territorial” parish. However, German still remained a second language in the parish for many years. The current church, built in a northern French Gothic style, was completed in 1924. 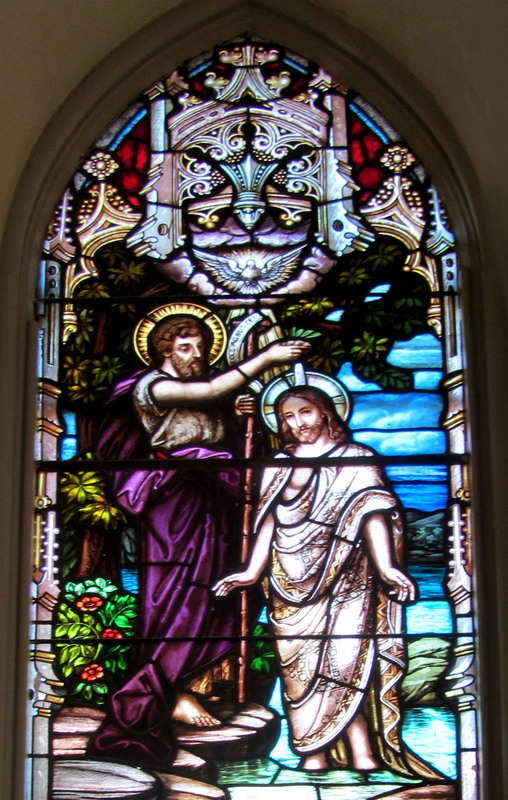 The stained glass windows were fabricated by the Munich Glass Company of Chicago. 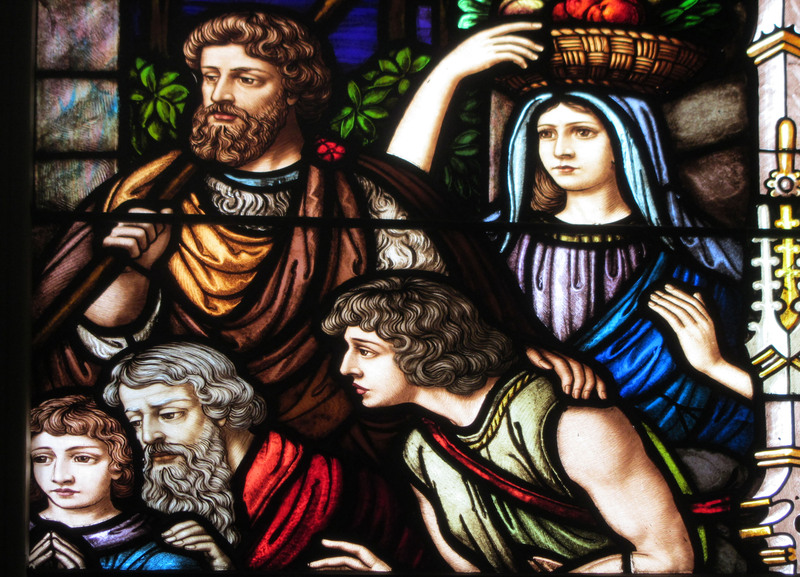 A fuller description of the church’s history and discussion of each of its beautiful windows may found on the “Church” page located elsewhere in this blog. This link will take you to the Guardian Angels Church page. Remember, you can enlarge any image simply by clicking on it, even twice if you want to get an closer look. The colors are dramatic throughout all of the windows in Guardian Angels. Some of the figurative painting, particularly some of the faces are arresting and powerful. However, I think a couple of the windows, among this excellent collection, are particularly noteworthy. 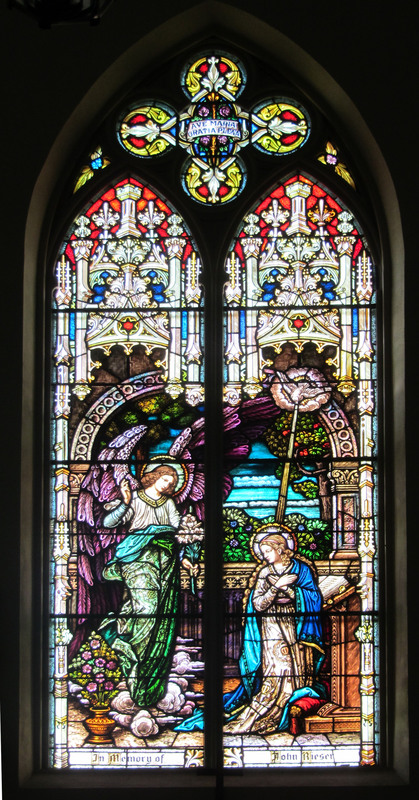 For some reasons I am consistently attracted to windows that depict the Annunciation. Perhaps it is the mystery of the scene, its joining of the heavenly and earthly in this specially charged event. There is usually a quality in these windows that communicates the mysterious communication between the Angel Gabriel and Mary. The iconography of the scene is usually consistent, with Angel, the lily, and Mary at her devotion, and of course the dove or holy spirit. The window here at Guardian Angels is particularly beautiful and moving. 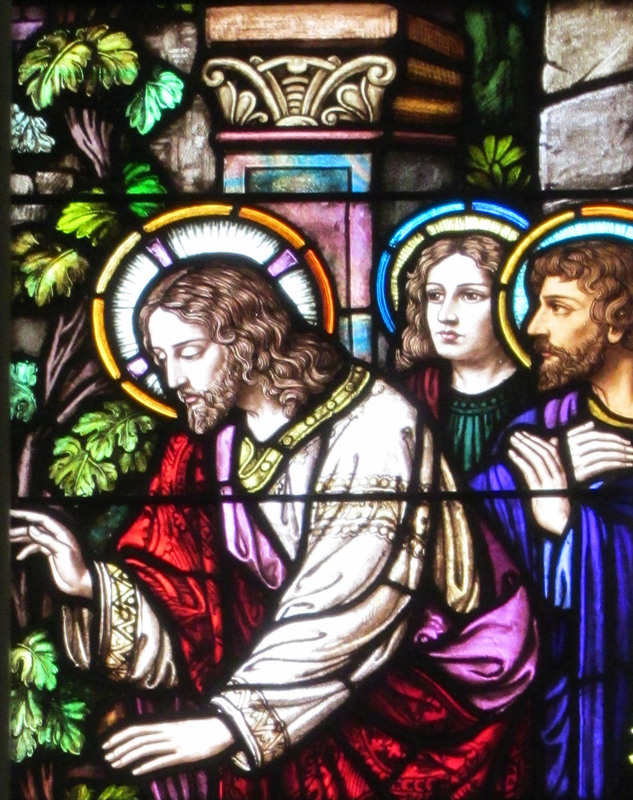 In this window, as in others throughout the church, the colors are brilliant. 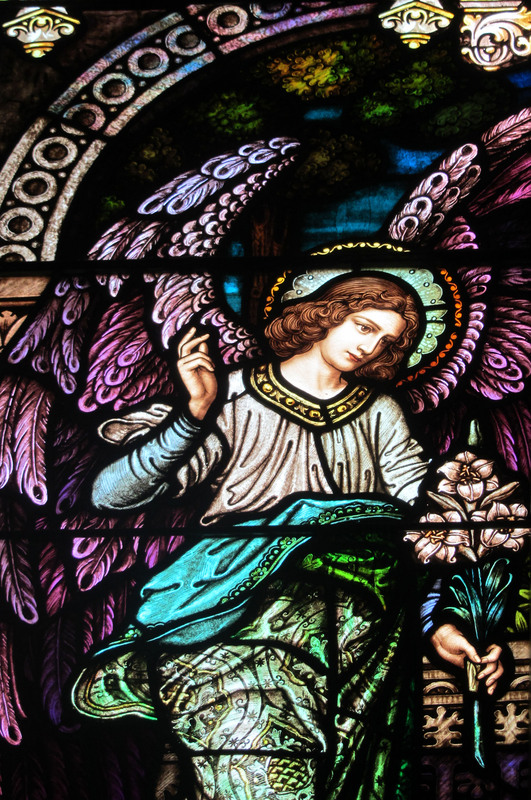 The large scale and power of the Angel, with his flowing garments, enormous violet wings, and blooming lily is in contrast to Mary’s quiet, somewhat startled demeanor and the soft blue of her gown. 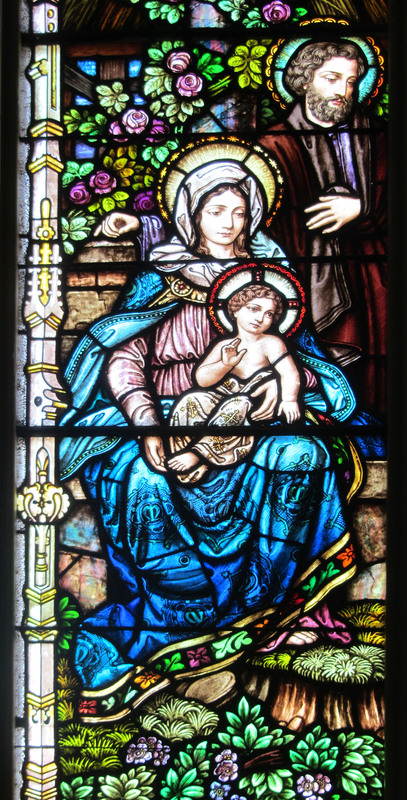 One of the formal aspects of this window that I find particularly effective is the way the “S” curve of the angel Gabriel is reflected in Mary’s gentle curved posture. The reflected forms communicate the moment of communication between the two of them. Power from Gabriel is being matched by the more gentle response from Mary as the she is graced by the Holy Spirit from high above her. I find this depiction of this special moment magical and emotional. Of course, the separation of the two panels also emphasizes their very different natures and realities. Another window I find moving and beautiful is the adoration of the Maji. 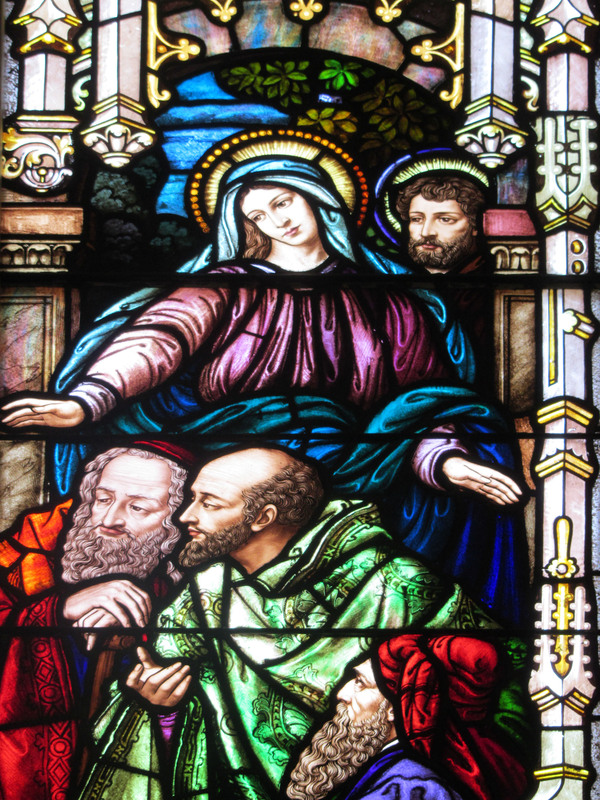 I find the grouping of the Holy Family and the three kings to be particularly effective. 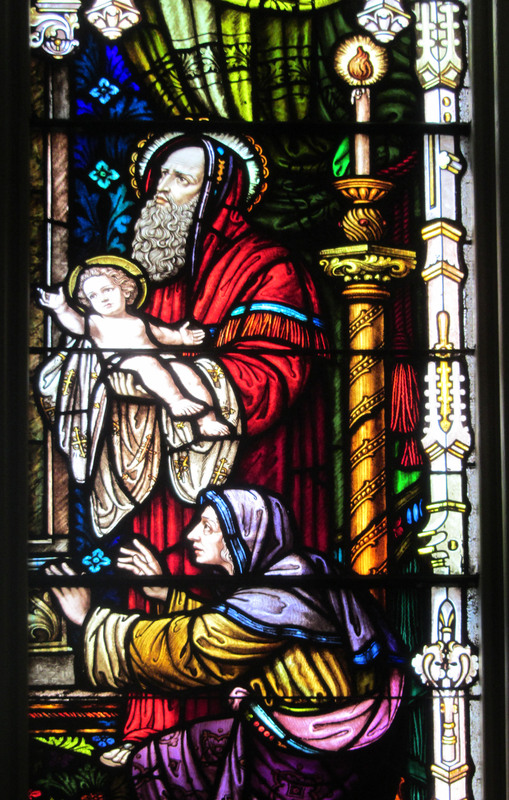 Mary, Joseph and child are facing us, open and receptive. In contrast , the three kings are pulled tightly close together in a strong and massive presence. Again, the delicate colors of the Virgin and Child are contrasted in the opposite panel with bold and bright colors and designs of kings’ garb. The balance and contrast is further enhanced by the grouping of three figures on each side of the physical divide between the panels. 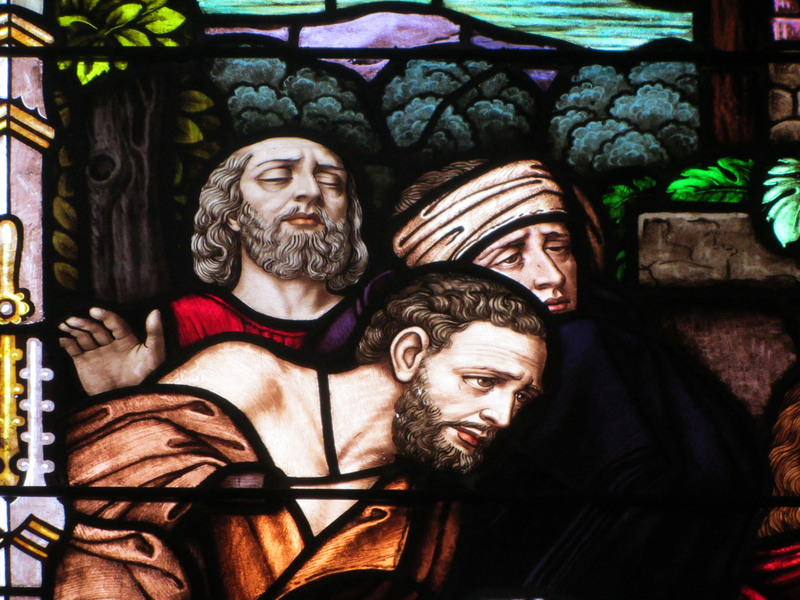 Here is a look at some of the personalities that we meet in these and other windows. 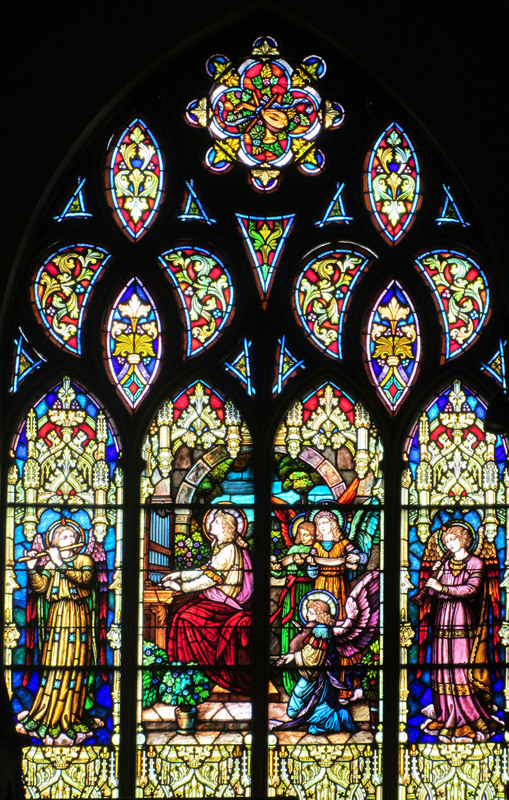 Finally, the St. Cecilia window is stunning in its majesty, its colors, and the joyous participation of its angelic musicians as they join St. Cecilia in her music of praise. While the architectural elements in the other windows in the church are white with accents of gold, here the architectural elements glow in a radiant burnished gold and the elaborate tracery above the saint and her group of angels pulls the entire window upward in an explosion of music” and worshipful celebration. Again, the colors are wonderfully expressive, with lavenders, blues, soft reds, and greens. In contrast to the richly vivid colors and patterns we have seen in many of the more “earthly” bound windows in the nave below, the softer colors and the radiance in this window are powerful and yet calming, reassuring and joyous. It is thrilling to stand in the main floor of this church and look up at this wonderful window. So from its humble beginnings and its first services held in a small grocery, Guardian Angels continues to be a center of worship, fellowship and caring, serving its community in this mid-town parish for over one hundred years. This entry was posted in 20th Century, Kansas City, Missouri Area, New Testament, United States and tagged Annunciation, Apostles, Baptism, Children, Healing, Nativity, Presentation, St. Cecelia, Temple. Bookmark the permalink. Your explanations really helped me to understand how to look at this art, from your comments on the s shapes to the open vs closed postures and the yse of vivid vs subtle colors. Wonderful. Thanks so much, Alison. I really appreciate your comments.